Mama Rose (Michelle Barber) confronts reality and the ghost light of a darkened theatre. Photo by George Byron Griffiths. 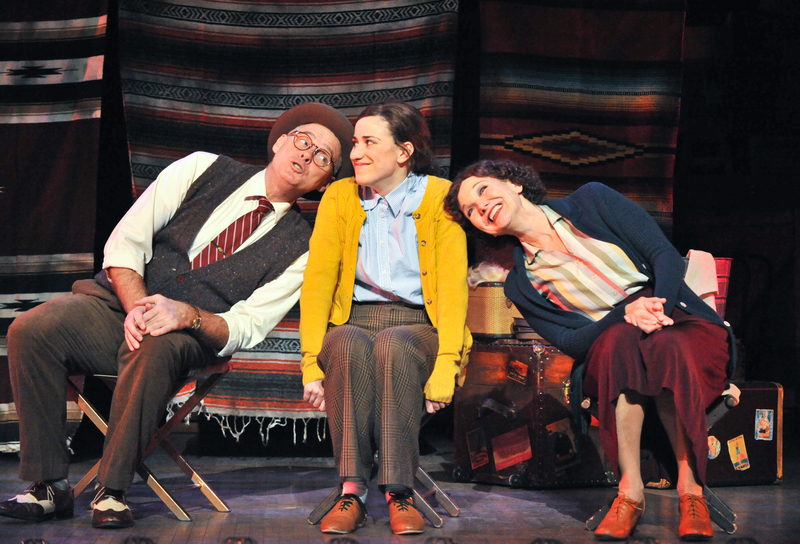 Audience members at the Pantages in Downtown Minneapolis last Saturday night were absolutely enamored with Theater Latté Da and Hennepin Theatre Trust’s production of Gypsy, directed by Peter Rothstein. The 1959 musical adaptation of the early life and career of writer, actress, television personality, and legendary burlesque entertainer Gypsy Rose Lee has become one of the most well-known and beloved contributions to the genre, and this production highlights some of the reasons why. Part of the audience reaction this weekend was no doubt delight in the familiar; themes from Jule Styne’s vibrant score are recognizable to even a musical theater novice, while Stephen Sondheim’s lyrics and Arther Laurents’s book form a complex and poignant picture of family, ambition, tenacity, and (of course) life in show business. The harder trick to pull is showing an audience something they already love while also showing them something fresh, but Rothstein’s Gypsy succeeds in just that. Michael Hoover’s scenic design brings backstage onstage—upstage is caked with old props and costumes, downstage decked with ever-changing scene placards and proscenium lights, and even casting choices play into a make-due-with-what-you-got, let’s-put-on-a-show visual motif and vibe right out of vaudeville. Most scenes, especially early on, run at a fast clip; there are some times this quick pace does not allow the few tender or sentimental moments to fully land, but it drives the audience toward two positively goosebump-inducing numbers at the ends of both acts. 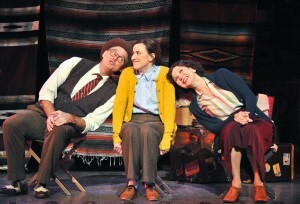 Herbie (Tod Peterson), Louise (Cat Brindisi), and Rose (Michelle Barber) enjoy a moment in show biz. Photo by George Byron Griffiths. Any production of Gypsy begins and ends with Mama Rose, and Michelle Barber is just fantastic in the role. Barber’s Rose begins as the brash and fast-talking “mother of all stage mothers,” recalling Ethel Merman (who originated of the role), but Barber is also able to show us the cracks in the façade, making the Act 1 finale “Everything’s Coming Up Roses” more ominous than inspiring and her “Roses’ Turn” downright chilling. Playing the sensitive yet talentless daughter Louise is Barber’s real-life and very talented daughter Cat Brinsidi, who captures both the young girl’s longing for maternal attention and the young woman’s desperation for independence. Tod Peterson plays their agent Herbie as a loveable pushover and specter of the happy family life that could have been, highlighting the tragedy brought to Louise’s life through Rose’s pathological focus on making her a star. Other than the three leads, almost everyone plays multiple parts: Eriq Nelson holds the record for the night, appearing in practically every screen in at least ten different roles all told (and nailing the laugh laugh lines in each one), and Shinah Brashears sparkles as June in Act 1, continuing to shine as various characters in Act 2. Tyler Michaels has maybe the most inspired double-duty of the night, appearing (in addition to other ensemble parts) both as Tulsa, the object of young Louise’s unrequited teenage crush in a dreamy and sweet rendition of “All I Need Is the Girl,” and as the indolent Electra in the second-act showstopper “You Gotta Have a Gimmick.” Michaels joins Emily Jansen as the ditzy and endearing Tessie Tura and Kate Beahan as Mazeppa, probably the greatest role for a trumpet player in American musical theater. Michael Matthew Ferrell’s choreography is dazzling throughout, and Alice Fredrickson’s ingenious costumes help propel Brinsidi from the frumpy wallflower Louise into the elegant ecdysiast, Gypsy Rose Lee. Gypsy captures the highs and lows of life as a performer, the cost of pursuing a dream, and the complexity of family dynamics. The production currently running at the Pantages through March 13 as part of the Broadway Re-Imagined series is no exception, pulling it off with enough charm and wit to appeal to the newcomer and die-hard fan alike.